Last weekend was the first big race weekend of the year for us. 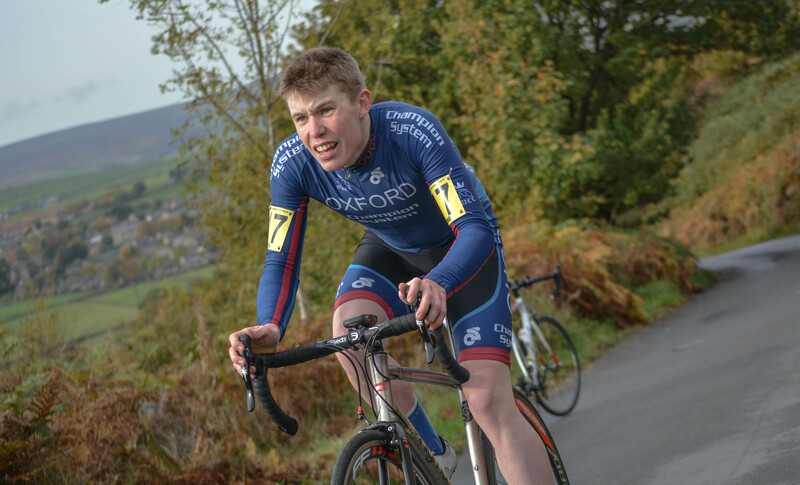 We had the BUCS Hill Climb on Saturday at Curbar Gap and a few riders headed up for the Nationals on Sunday at Jackon Bridge as well. 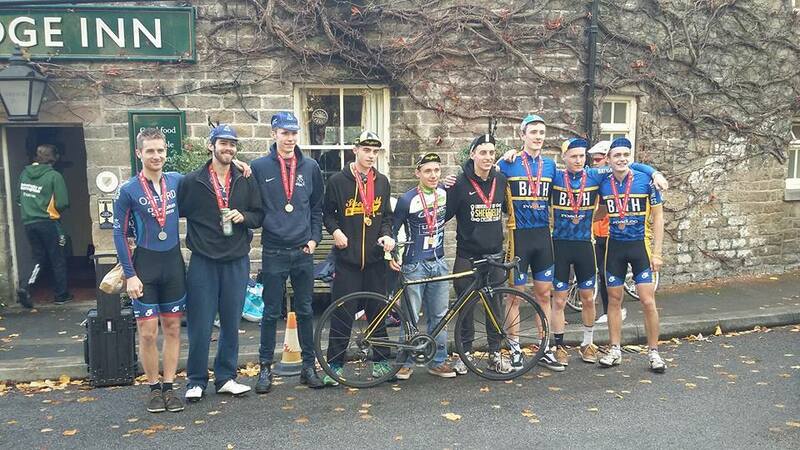 We secured the Silver Mens team and Bronze Womens Team at BUCS on Saturday, and had some good performances at Nationals on Sunday. 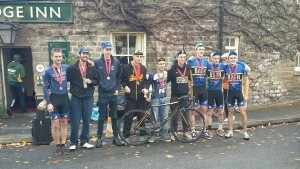 The fatal date finally arrived: the combo weekend with BUCS Hill climb and the nationals. I was looking forward to it and the training in the previous weeks was very draining – I wanted to race and be done with it! After a 3h drive we arrive in the village of Calver – it was rainy but not too cold. 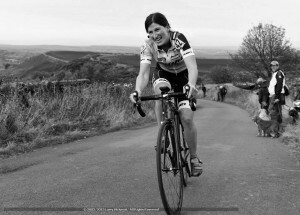 The women were off first – so Liv and I got ready, warming up next to current TT champion Hayley Simmonds. It stopped raining when I started, starting out of the saddle to reach the first steep bit of the climb the hardest. From that time it was 7’12 of pain, the atmosphere at the top was amazing and it definitely helped to push harder! I gave everything for the finished. 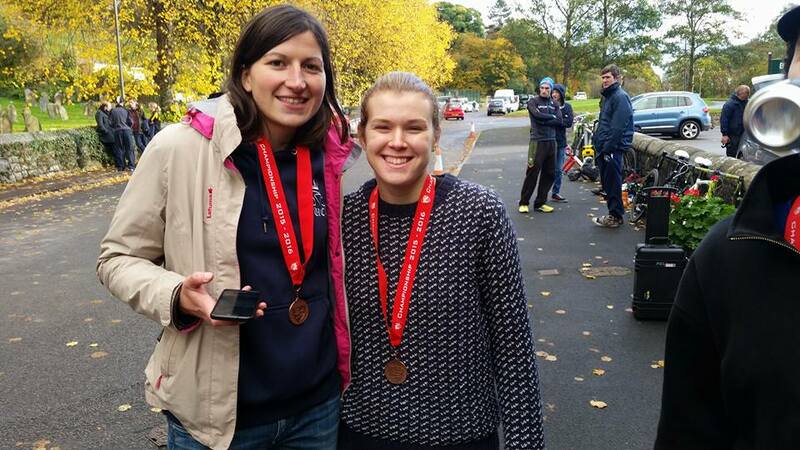 I did 4th and Liv finished 17th, our combined time allowed us to have the bronze as a team – we are both really proud of that. Another hour of driving to bring us to Jackson bridge for the national the following day. We drove up the hill before having dinner and relaxing before the national HC: another level! On Sunday morning Angus, Tom and I went to cycle to course before they close the roads. 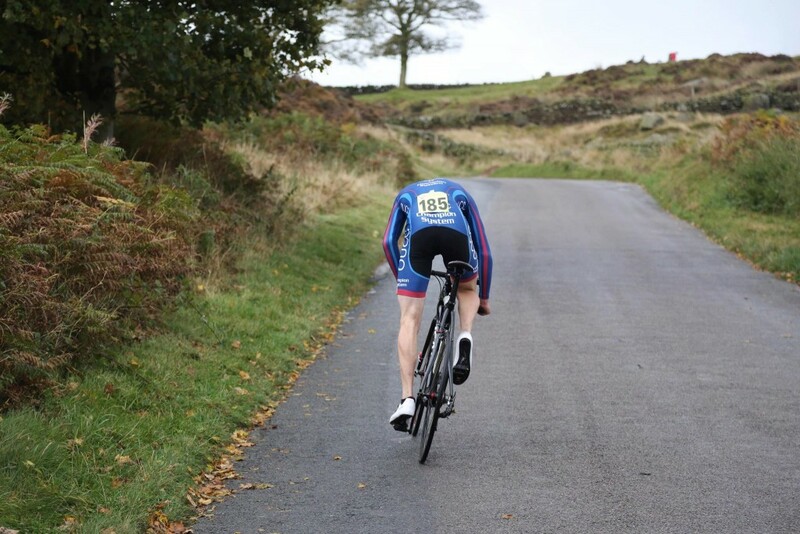 It is steep, and seems harder to pace than Curbar gap, we pick up our numbers before cycling back to the flat. Now there is 3h to wait for me before heading off, the stress is there, it is cold outside and I am not sure I want to do it. All the negative thoughts disappeared once I was warmed up. I went for it from the gun, I luckily avoided a mechanical on the first S corners when I stood up. 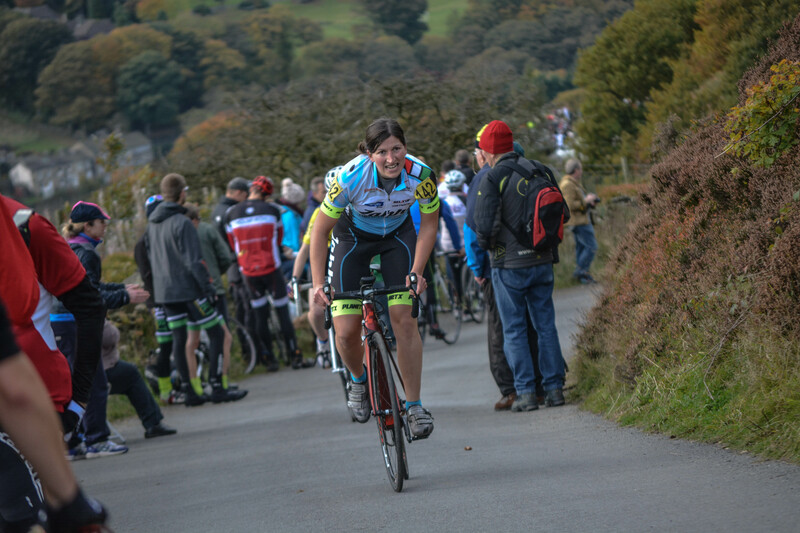 I overtook the girl ahead of me half way, that was a good sign – especially on that steep middle section. The number of people cheering me on and shouting my name was amazing! After the short downhill section before the bridge you can see it, the last few hundred meters of pain – I get out of the saddle to gain some speed in the corner. There are more and more people – they gave me strength to stand up the last 50m and finish empty. It was an amazing experience and I want to do it again next year! I finished 16th overall – the race was won by Maryka Sennema and Hayley Simmonds. The 2015 BUCS HC was never going to be easy. Just over a mile at 11% average gradient, it turns out, was enough to make me question realityâ€™s most basic precepts for a good few minutes, but weâ€™ll get back to that. I began my trademark perfunctory warm up in conditions that could only be described as typically moist for The North and rolled over to the start feeling cold af. Pumped up on adrenaline, I crushed it off the line earning many spun rear wheels on a) the wet starting mat and b) the leafy patches up the steep starting ramp (due in no small part to my skimpy 22mm quasi-slick tubs inflated to 8 bars and my aggressive out-of-the-saddle demeanour) only to monumentally explode about 1.2km in. Somehow I managed to keep the wheels turning all the way to the line but not without leaving both my life and soul on the road. The next 10 minutes were spent in a ditch by the side of the road, curled up in the foetal position. Despite getting the second fastest Strava time up the first half of the climb and Jakubâ€™s encouraging words â€œFly and die, the strategy of champions!â€ I couldnâ€™t help but think a better pacing strategy could have shaved off a few seconds. I feel a possible improvement for next year would be to actually look down at my power numbers; they are just there in front of me, after all. The effort was good enough for an even 400W and a time of 5:47 (a scant 48s faster than last yearâ€™s performance) which I can only be happy about. A certain sense of relief ensued when Oxford secured the Menâ€™s team silver thanks in no small part to Isaacâ€™s stompfest of a time of 5:23.8. 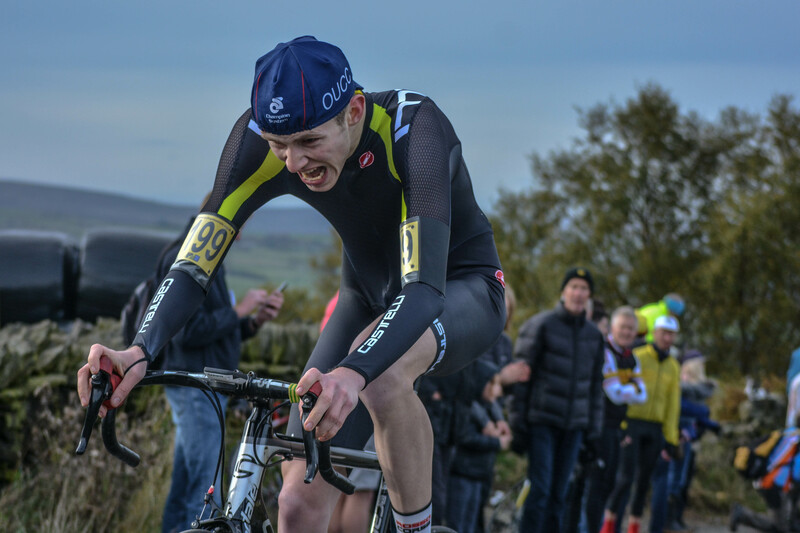 Sure enough, no later than during the drive home I wanted another crack at Curbar gap but sadly this climb will never feature in the BUCS event again. Good riddance. 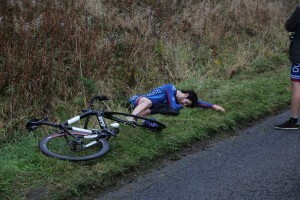 Some months ago, around the middle of July, I realised I was only riding hard on hills. Itâ€™s a basic sort of cycling; when you reach a climb, you smash it to the top. You donâ€™t decide for how long or how far, you go until you reach the summit. 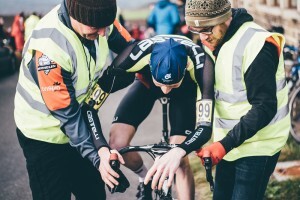 This realisation meant I spent August travelling around London and Surrey riding the nastiest, steepest, most gurn-inducing climbsI could find, so when Alasdair and Tom said they were going to race the Didcot Phoenix HC double, I jumped at it. I turned up not really knowing what I was doing apart from that I was supposed to race in a hat, and came away hooked. Here was something to focus on: the BUCS event in a couple of months. During the build up, I did increasingly frequent events, taking them more and more seriously. New shoes and pedals, my first cycle computer, borrowed wheels & skin suits, a lot of trips to Brill and too much time on Strava looking at power leaderboards meant that coming into Saturday I felt about as prepared as I could be, though nursing a cold and a cough. After a final walk of the hill, I began spinning on the road by the start, with the nerves accumulated in the last few weeks beginning to be dispelled by adrenaline at last. Knowing my minute man, Tim Allen, also helped calm things as we warmed up together, sharing an apprehension of the imminent pain. I then made what I think was probably an error. I popped into the pub to see what the current leading time was. â€œ5:17â€ someone breathed in shock. That was Bradburyesque, it was better than last year, it was astonishing and seemingly insurmountable. I was prepared to try for 5:30, based on last yearâ€™s results, and this threw all of that. The start felt steeper than I expected it to and I went hard to the crossroads, trying to get over the hump before settling down into the grind. It was then that I realised with a shock quite how hard sticking to 11.6mph was going to be. Reaching the first of the bends marking the upper reaches, I felt already spent with over two minutes to go. From then on all planning went out of the window and it became a battle, trying to make the training pay off. 5:23.8 is a time Iâ€™m proud of and Iâ€™m happy to be in the top 5 in my first BUCS competition. To be 1.4 seconds off a medal and 6 off the win is inspiring and frustrating in equal measure. 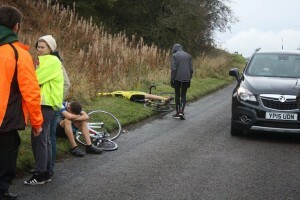 An aspect I found great about riding this event was having teammates around. Thank you Tamara for sorting all the entry faff (and congrats on 4th), Liv for showing you can hate hill climbs and still come in the top third of a strong field, Tom for sparking my interest in the characters and history of the sport, Angus for inspiring with a level of commitment and professionalism somewhat lacking in my approach and Daniel for reminding me itâ€™s only sodding bike racing. 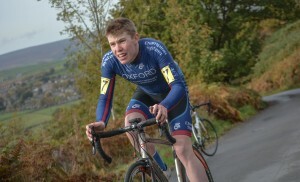 Thanks to Rusellis Photography, VeloUK, and Ellen Irshewood for the photos!